Get the best prices on Indianapolis Colts hotels from WorldsBestDeals.com. 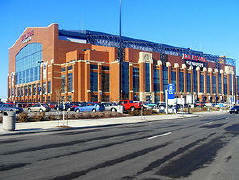 Lucas Oil Stadium is located off of Capitol Avenue, one block from Downtown's Circle Centre Mall. This is your source for hotels near the Indianapolis Colts football Lucas Oil Stadium as well as car rentals, flights, local weather and guaranteed low hotel rates. For more Indianapolis, Indiana hotel options click here, or use the form below for the next Colts football game. For single game tickets call the Lucas Oil Stadium Office (317) 239-5151. You can also call the Colts ticket office at (317) 297-7000 to request an individual game order form. Chicago, IL I-65 South to West Street (Exit 114), South to Maryland St. South Bend, IN US 31 South to I-465 West; I-65 South to West Street (Exit 114), south to Maryland Street. 69 South I-465 South to I-70 West to I-65 North to West Street (Exit 114), South to Maryland Street. I-65 (from the south through Nashville and Louisville, continuing to Chicago) From Louisville, KY I-65 North to I-70 West to West Street (Exit 79A), right to Maryland Street. From Airport Airport Expressway to I-70 East to West Street (Exit 79A), left to Maryland Street. I-70 (from Baltimore, south of Pittsburgh, through Columbus and north of Dayton, through Indy to St. Louis and through the Midwest) Columbus, OH I-70 West to I-65 North to West Street (Exit 114); South to Maryland Street. Cincinnati, OH I-74 West to I465 West; I-65 North to I-70 West to West Street (exit 79A). Right to Maryland Street. I-74 (from Cincinnati through Illinois) I-70 (from Baltimore, south of Pittsburgh, through Columbus and north of Dayton, through Indy to St. Louis and through the Midwest) Terre Haute, IN I-70 East to West Street (Exit 79A). Left to Maryland Street. Danville, IL I-74 East to I-465 South; I-70 East to West Street (Exit 79-A). Left to Maryland Street.